Over the last couple of years the above tamping techniques have been dismantled and have been proven detrimental to the overal puck quality. Let’s start at the beginning, pressing the coffee into a puck. The age old question that people always ask is, “How much force should I press down with?”. Years ago the answer usually was to fetch the bathroom scale and exert X amount of force and then try to repeat that while tamping espresso. Personally that’s something I’ve never recommended. There honestly is no correct pressure. The key in tamping pressure is to be consistent in order to create coffee pucks with the same density every single time. If the tamping pressure is consistent you can easily adjust the density of the puck by adjusting the coarseness of the ground coffee on the grinder. Another issue arises in the second step, knocking the stray grounds loose. These stray grounds are a product of an undersized tamper. The problem that this knocking creates are tiny little fractures. Those fractures then lead to small channels that the water flows through more easily which results in an underextracted espresso. Plus you beat up and damage your portafilter. The third issue is level tamping. The water in an espresso machine will always take the path of least resistance. Coffee compressed unevenly will offer less resistance in parts of the puck and those areas are where the most water will flow through. That means that some coffee will be over extracted and some of it will be under extracted. That doesn’t mean however that the resulting espresso is perfectly balanced, instead it’s an espresso that has the bad flavors of under and over extracted coffee at the same time! Polishing the coffee puck doesn’t have any benefits to the extraction of the coffee, it’s merely a cosmetic thing that only the barista will ever see. By polishing the puck there is however a severe risk of damaging the puck or pressing it crooked. The first thing you’ll notice when you take the tamper out of its packaging is the weight. At 1150 grams (2.5 lbs) it is by far the heaviest tamper I’ve ever used. The weight is actually beneficial too as you don’t need to use as much force to compress the coffee. In fact, most of the time it feels as if I’m not using any force to speak of at all, which is good news for people that suffer from wrist or arm joint problems. Mahlgut tampers also strive to give you the tools to combat all the above problems. Mahlgut tampers all have a few basic design features. The most obvious one is that they have a stepped design. The business end of the tampers are milled to a precise diameter so it fits your basket perfectly, eliminating the need for knocking stray grounds loose and re-tamping. The handle of the tamper features an adjustable ring that presses against the top of your filter basket. In theory this gives you a hard limit that should result in a coffee puck that always has the same density. In practice this actually works quite well, as long as you use the same amount of coffee ground to same coarseness. And last but certainly not least, pressing the tamper all the way down on the basket means it’s always exactly level. 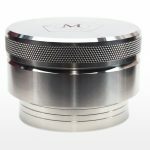 Mahlgut has easily one of the most customizable high end tampers on the market. This Palm Tamper is fully made from stainless steel, which explains why it is as heavy as it is. If you’d want a lighter version there’s an option for an aluminum grip anodized in various colors that weighs in at roughly half the weight (650 grams / 1.4 lbs). Mahlgut recently added an option for a wooden (German Oak) handle that brings the weight down even further to 550 grams / 1.2 lbs. If you’d rather have a traditional grip, Mahlgut offers that as well. 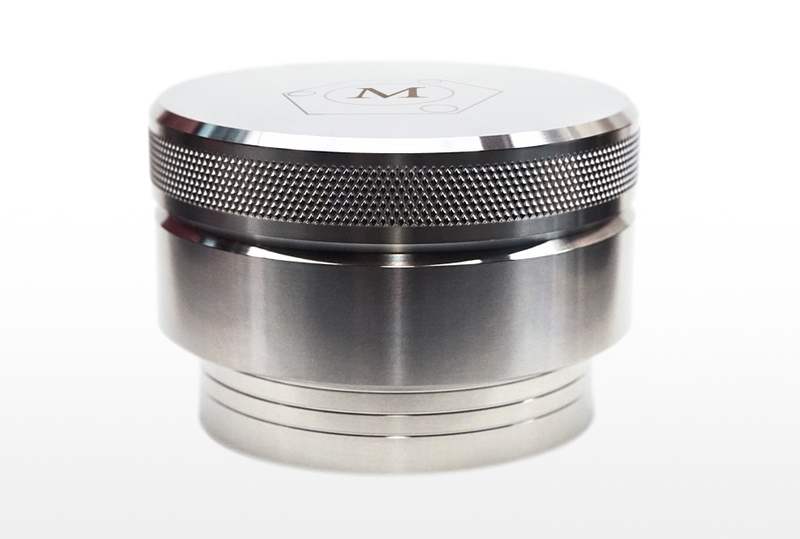 The Mahlgut tampers solve problems that are unavoidable with traditional tamping. First and foremost, you will never ever tamp uneven again. The weight of the tamper makes it feel like a proper and reliable tool. In addition to all that it offers a simple way of making consistent coffee pucks by limiting how far down you can press the tamper. When you switch to a different bean and need to adjust that depth, adjustments are quick and easy to make. The only downside is that you need to make sure that you use the same amount of coffee ground to the same coarseness. But then again, you should be doing that in one way or another anyway. Can’t destroy the puck by polishing anymore! The Mahlgut tampers are for sale on their official website: www.mahlgut.eu.